At TIPCO, we are experts in Treasury digitalisation. Our web-based Treasury Information Platform TIP leverages data from various source systems, supplements these with information provided by local subsidiaries and offers a comprehensive toolbox for data analysis and reporting. By combining IT-skills with many years of treasury expertise, we have made TIP the solution of choice for some of the leading companies in Europe across various industries. More than 120 clients trust in TIP and in our ability to provide market-leading treasury innovation. We attach particular importance to teamwork because we believe that an excellent working environment is the key to excellent work. We are proud of our employees as every one of them is the basis for the satisfaction of our clients and the success of TIP. We encourage further education and training and we are willing to give professional newcomers and lateral entrants a chance to discover the world at the interface of treasury and technology. 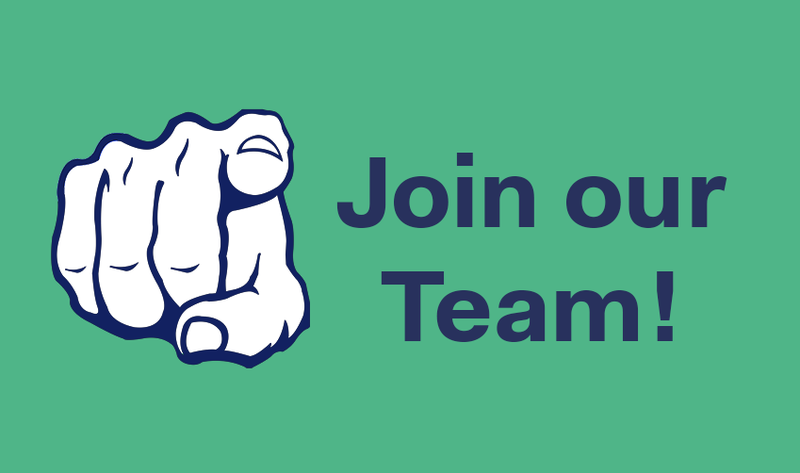 Please, note: Our job ads are in German as you need to speak our corporate language fluently. Find more TIPCO jobs at karriere.at. Our web-based Treasury Information Platform TIP leverages data from various source systems, supplements these with information provided by local subsidiaries and offers a comprehensive toolbox for data analysis and reporting. By combining IT-skills with many years of treasury expertise, we have made TIP the solution of choice for some of the leading companies in Europe across various industries. More than 120 clients trust in TIP and in our ability to provide market-leading treasury innovation. TIPCO currently employs around 50 staff members. 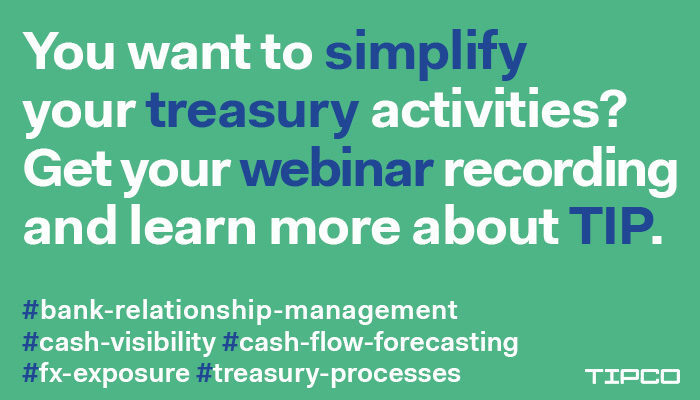 Treasury solutions with TIP – revisit our webinars. From February to June, we focused on a new area of treasury every month and presented possible solutions in our treasury webinars with which daily tasks can be organised and tackled efficiently and easily. The kick-off was with our bank relationship management module, which not only monitors, compares and reduces bank fees largely automatically, but also allows you to access and analyse all other data associated with bank relationships at the press of a button. Our cash visibility webinar mainly dealt with gaining an overview of all cash flows within your corporate group. Which bank accounts exist and where? How is group-wide liquidity looking? And how can you easily analyse all relevant data in simple reports to keep yourself and your management continuously up-to-date? Since good cash flow forecasting needs to fulfil many requirements, the overview was followed by a detailed view of the cash flow forecasting module. How can you leverage your historical data in order to look ahead as reliably as possible? How are data from your subsidiaries taken into account in your forecasts without numerous emails and phone calls in advance? The treasury information platform TIP also offers solutions related to the issues of FX exposure and IFRS 9 reporting; solutions which, closely integrated with smart workflows, can simplify your reconciliation processes and avoid transmission errors. They also make your work more efficient and accurate. The participants in the last of this webinar series, focussing on treasury processes, discovered how this works in practice with the aid of automated workflows. If you missed one of the treasury webinars and want to find out more about it, don’t worry. Simply request access to recordings on our Free Your Data webinar page or request a demo. We will also be happy to discuss your requirements in person. If you also want to be kept posted, simply sign up on our website to our newsletter. How can we support the requirements of Treasury departments to an even greater degree now and in the future? Who is in a better position to know what a system must be able to do than a treasurer with many years of experience? No-one. This is why we invited eight experienced treasurers and TIP users to become members and guests of our TIPCO Advisory Board. The aim of the TIPCO Advisory Board is to address the requirements of companies at an early stage, to give feedback on planned products and to test new modules and services for their suitability for daily use. 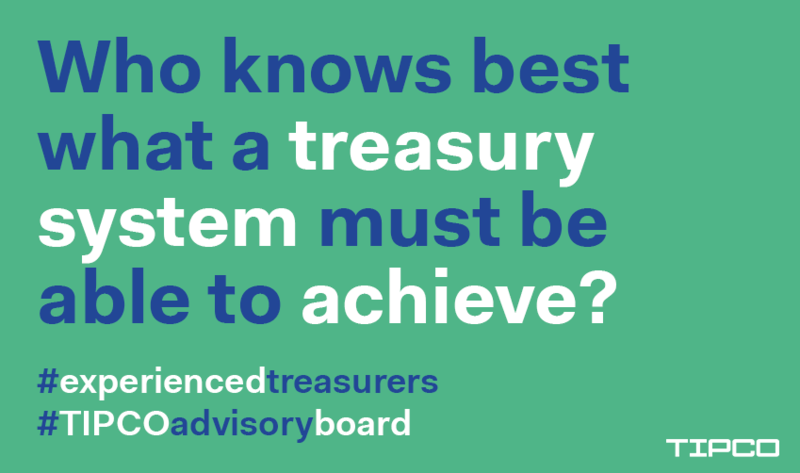 What are the strengths of the Treasury Information Platform TIP? Which additional functionalities would be desirable? How is TIP used in practice every day? A wide range of topics was covered during the first meeting at our head office in Vienna, reflecting above all the need for even more digitalisation. Keywords such as ‘predictive analytics’, ‘self-service BI’, ‘eBAM’ and ‘robotics’ were high on the agenda. In addition to grand visions, there were also a number of smaller suggestions for improvement which were a great help to us. After all, only when used every day can it be clearly seen how meaningful intelligent input screens are, how quickly tasks can be implemented and how intuitively the application actually is in practice. Our eight sparring partners pulled no punches in the first meeting, for which we are very grateful to them. Nevertheless, we were able to spend the day in the company of very satisfied customers, confirming the performance claim and quality of TIP. The TIPCO Advisory Board consists of seven experienced treasurers and the management of TIPCO and will convene at least twice a year. We would like to express our sincere gratitude to our Advisory Board members and our guest expert for a very constructive and enjoyable first meeting. We are delighted to announce the addition of a new partner. As Head of Consulting, Martin Fikar is one of our leading treasury experts who provides our consultants with valuable support. Diverse perspectives and action-oriented decision-makers are key to the quality of our work, which is why we strive to make our management team as broad-based as possible. 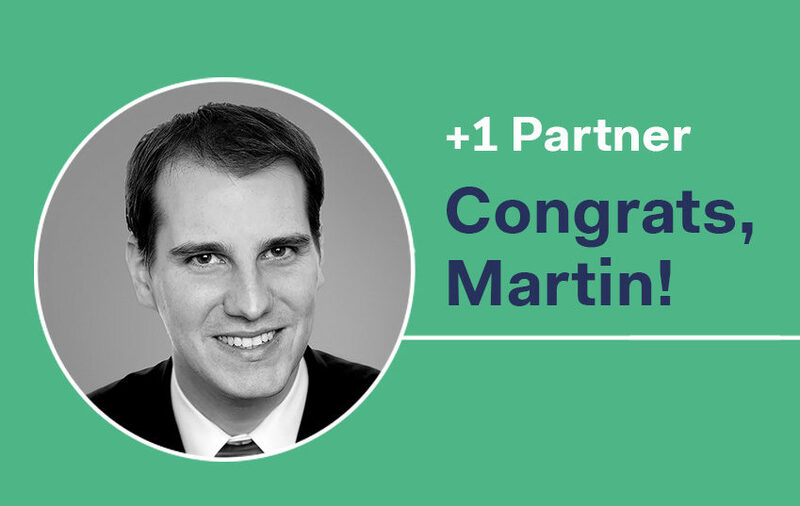 Martin is not only one of our most important experts, but also an exemplary team player with outstanding leadership skills. That’s why we are delighted that he has decided to take on this new position and to play an even more important role within the company in the interests of our clients and his colleagues. Congratulations Martin, and, most of all, thanks! Merck wins the 2018 Treasury Today Adam Smith Award! 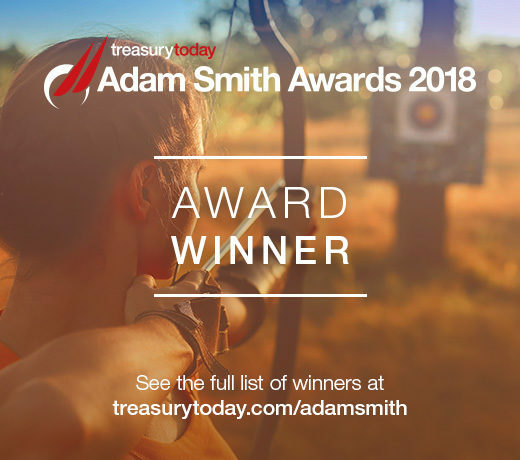 We sincerely congratulate our corporate client, Merck for winning the 2018 Treasury Today Adam Smith Award for First Class Relationship Management. It was a pleasure to be part of the treasury transformation process at Merck! Digitalisation was one of the key issues discussed at all treasury conferences in 2017 and will be top of agendas again this year. Our FREE YOUR DATA webinar series highlights that there is much more to this overused phrase than you might think. 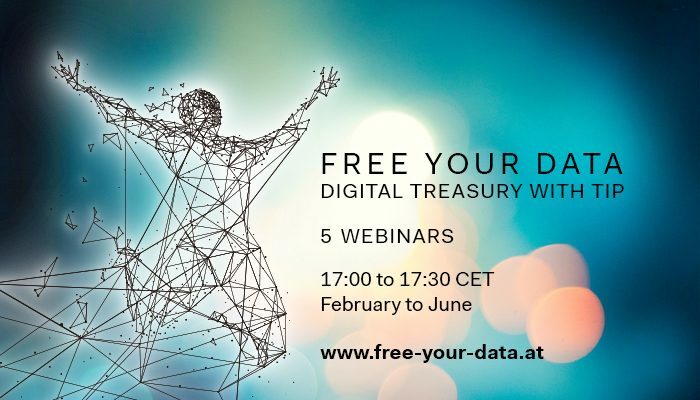 Five short webinars provide you an insight into various treasury application areas and include specific examples of how our clients are already benefiting from digitalisation. Invest 30 minutes and discover how smart solutions can not only save you time but also considerably improve the quality of your outputs.